Ziplining is a thrilling outdoor activity during which a rider wears a harness that is securely connected, via carabiner and pulley system, to a cable suspended high above the ground. The rider then glides along the cable for a uniquely exhilarating experience. 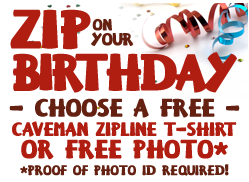 What does the Caveman Zipline tour include? Your zipline tour includes four zipline runs of various lengths, along with three, intermittent sky bridge walks. Historical information pertaining to the area will be provided, plus all the equipment and safety information you'll need to have a safe and exciting adventure. How long is a zipline tour? Your tour can last up to ninety minutes depending on group size, plus additional time for check-in and orientation/ground schooling. Please arrive 30 minutes prior to your scheduled tour departure time. Please allow ½ hours - 1 1/2 hours for completion of your zipline canopy tour. How much does a zipline canopy tour cost? The rates are as follows: Adults $49, Children (ages 10-12) $39, and Active Military $39. Do you have any specials or discounts for large groups? Yes, group rates of $25 per person are available for ten or more individuals. Reservations are needed. A 48 hour notice must be given prior to scheduled tour time to receive refund of deposit. No acceptations will be made. Tours are for seen to book quickly. Reserve your spot today. Yes. The group rate of $25 per person will be issued for groups of 10 or more to celebrate special occasions such as birthday celebrations. Both indoor and outdoor seating facilities are available for accommodating groups, per request. A restaurant is on site offering a full menu selection (including sandwiches, pizza, and etc. ), along with a snack bar, and ice cream. You are welcome to bring your own celebration cake. Yes, gift certificates/cards are available per request. All major credit cards are accepted. Debit cards may be used in place of credit card and vice versa. For safety reasons, participants must be at least 10 years of age and must weigh at least 80 lbs. and no more than 270 lbs. The zipline canopy tour is designed for use by participants of average mobility and strength, and who are in reasonably good health. Participants should not be pregnant, and be free from back, foot, heart or respiratory problems. What if I have high blood pressure, can I zip? It is not recommend that you zip. Please contact your physician for approval. What if I have a belly piercing? Due to the placement of the safety harness, body piercings are to be removed prior to arrival. Participants must wear close-toed shoes (such as tennis shoes), comfortable clothing, and free from jewelry. Long hair needs to be tied back. Each participant will be fitted with a seat harness, a lanyard with safety clips, pulley system, gloves, and a UIAA/CE certified helmet specially designed for a zipline canopy course. How many zipline runs will we do? Your zipline canopy tour will take you on 4 different ziplines of varying lengths ranging from 250 ft.-1200 ft.
Riders may reach speeds of up to 35-50 mph while ziplining. During the tour you will be at varying heights from 54-82 feet above the ground. It is not uncommon to have a fear of heights. Many people who have a fear of heights are still able to enjoy our zipline tour. Participants will be will be clipped in at ALL times while on tour. Our certified guides are thoroughly trained in zipline course procedures, and will be with you throughout the entire course to answer all your questions. Zipline canopy tours will operate in the rain. However, the course will be closed if there is lightening activity in the area. In event of company cancellations due to inclement weather, a voucher/gift card will be issued for future usage; no cash refunds will be given. All adventure activities done above the ground carry certain inherent risks. We have taken numerous steps to limit possibility of these risks occurring. Our course has been built to meet or exceed ACCT (Association for Challenge Course Technology) professional building standards as well as guidelines established by local, county building regulations. Furthermore, guides are professionally trained and certified. The course and equipment are inspected daily. Ziplining is intended to be exciting and produce an adrenaline rush, but safety is our top priority. GAC (Galvanized Aircraft Cable) cables can support up to 22,600 lbs. each and the zipline course is outfitted with a special Prusick braking system so riders can experience the excitement while still feeling secure. Participants are clipped to a GAC belay cables at ALL times reducing the fear level of individuals. The course has been certified by ACCT, the Association for Challenge Course Technology. No, children are not allowed to ride with an adult. The harness used is designed for one participant only. No prior experience is needed. Our well-trained, certified guides will give you a complete orientation and ground training session before your zipline canopy tour departure. We can take up to 10 participants per tour. If you have a group of 10 or less and have reserved a tour at the same date/time, you will zip together. If you have more questions, please contact us at 573-468-9477.